Thankfully it’s half term, meaning that I have more time to write and relax, although I do have a large amount of work to get done. Last weekend was really busy as we’ve started having some building work done, hence why I didn’t post last week! So I thought I’d do a short post today simply talking about why I write and what got me into writing etc. It’s only short as I’m working on a piece at the moment, but hopefully I can do a better post next week. The thing that got me into writing was the fact that I’ve always been a daydreamer and have loved reading since I learned how to! When I was little I used to see my Grandma a lot and she used to read poetry to me. It was that that got me into loving poetry. Also, I’ve written stories ever since I was small, my first (as far as I remember) was called “When Badger Saw the Sun” – I think! There were probably about ten words per page and about six pages, and then awful drawings (I never have been able to draw) but I still have it somewhere. I haven’t written many stories since I got into writing poetry, however I am trying harder now, and I’m going to try to complete NaNoWriMo, just to get me regularly writing and practising. I’m not too bothered whether what I write is good or not, providing I have written something, I’ll be happy! Anyway, I know today was a short post, but that’s because I’ve been doing quite a lot of writing recently, especially today, and so haven’t had much time to write on here. Next week’s post will hopefully be a lot better and more interesting! 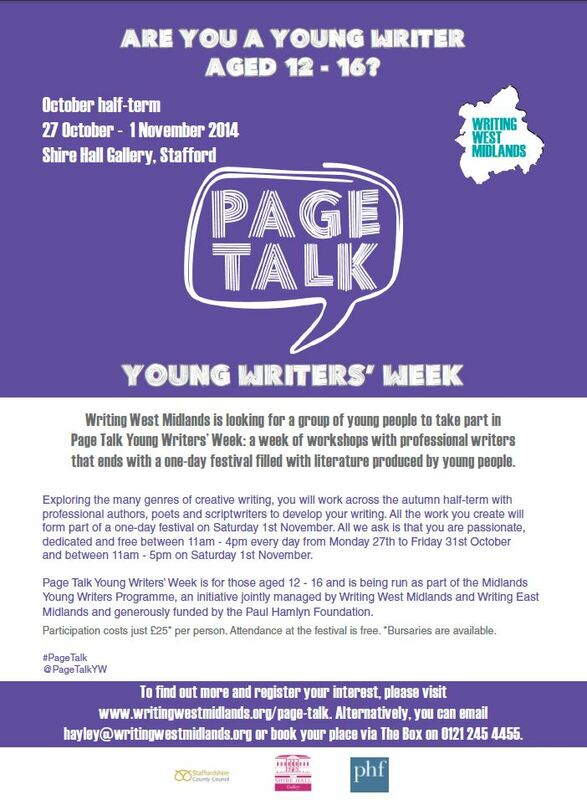 So coming up this half term is a writing week for young people in Staffordshire. The event is called Page Talk, and lasts for five days in Stafford. 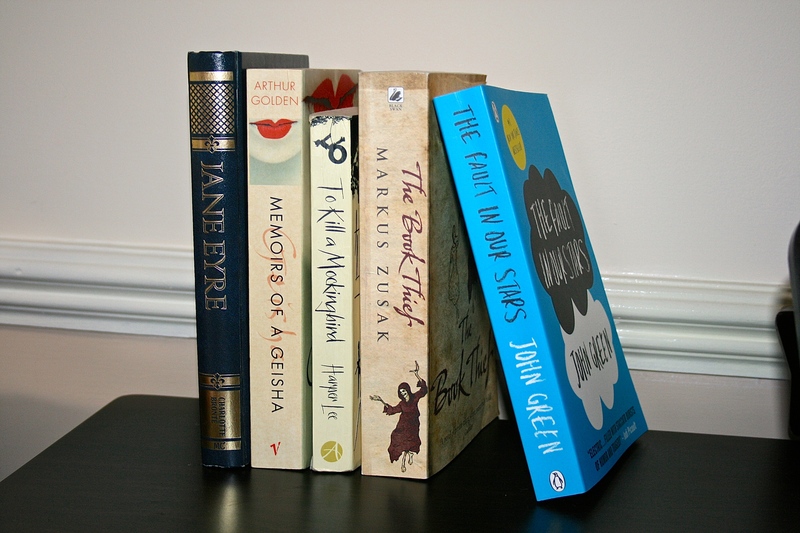 There will be established writers who have had things published, working alongside the young people in the workshops. Personally, I think this sounds like a fantastic opportunity and I have been to the place where the workshops are held and it is gorgeous – a wonderful place to work! Anyone reading this post who is aged 12-16, I’d take a look because it really does sound interesting! There is a Facebook page for the event (just search page talk), as well as a twitter account: https://twitter.com/PageTalkYW – definitely worth a follow! It costs £25 per person however for a week with professionals that is pretty good! You complete various tasks through the week and then on Saturday 1st November you can showcase your work at a festival which finishes the week off perfectly! 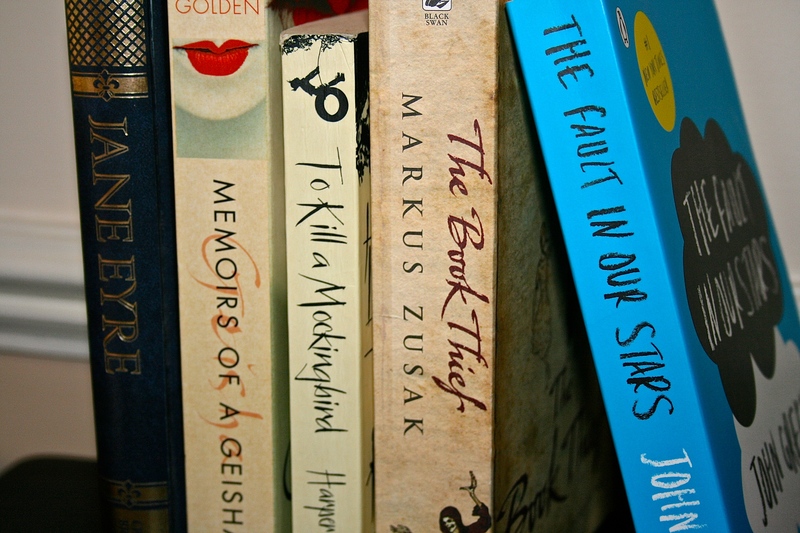 So for this week’s blog post I’d thought I’d talk about my favourite books. I wasn’t sure about what else to write about so I thought, well, why not? So here we are. 1. To Kill a Mockingbird – Harper Lee. This has to be my favourite book of all time. It’s the sweetest story ever and the characters are loveable and the narration is perfect for the story. I absolutely adore this book and of all the books I’ve read, if someone asked me to recommend them one, this would be it. Lee tells the story of Scout and Jem finch perfectly and portrays racism through the eyes of the children and many adults could do with taking a lesson from them! Atticus is a superb role model for the children despite the hatred he gets in the novel and some of the advice he gives his children in the book I try to use in my daily life. As you can tell my copy of this book is rather battered as I’ve read it three times completely and often flick through for a quote or to remember something. I first read it when I was in year eight (the summer before going into year nine), I think it was then anyway, or maybe the year before. I know I was quite young when I read it but I loved it so much and I can safely say that this is a book that will go with me to university and never go to the charity shop! 2. 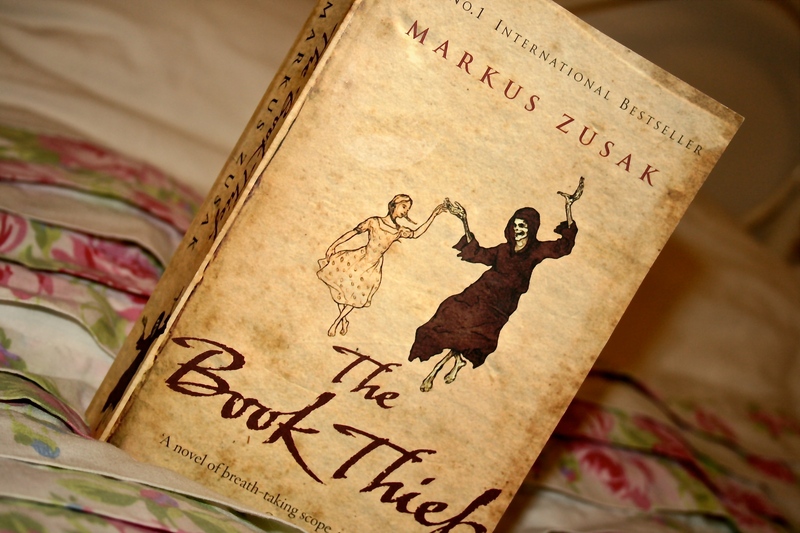 The Book Thief – Markus Zusak. Okay, so the reason for me reading this book is because I saw the trailer for the film and thought it looked really good but seeing as the book came first I wanted to read the book before the film came out. I really wish I’d heard of it earlier because after I’d gotten used to the interesting choice of narrator I fell in love with the story and the characters. Don’t be put off by the fact that this book is so thick, you’ll eat it up once you get into it. It tells such a charming tale of Liesel and her adoptive family, love of books and new friends. It’s a must-read. I loved the little comments that the narrator makes as they lightened the mood of the book and made it more readable and it was easier to connect with the strange choice of narrator. Although this book (I believe) is marketed for teenagers and young adults, I would recommend this book to anyone as it is one of those books that is just timeless and anyone can enjoy. I know retired people who have read this book and enjoyed it. It really is that type of book that everyone can enjoy because it is such a heartwarming story. 3. 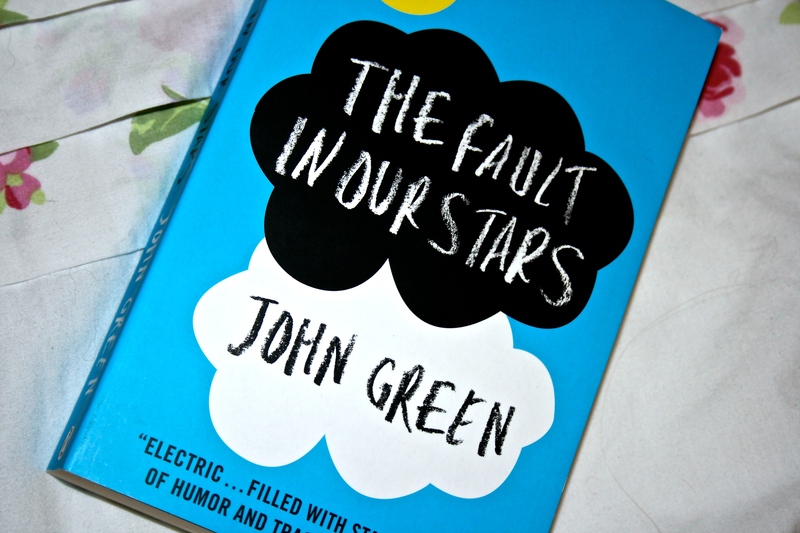 The Fault in Our Stars – John Green. Sorry to sound like a typical teenage girl but this book made me both laugh and cry and it had to go in this list for that reason alone. The story is very sweet, and the reason I liked it was because it wasn’t your typical “I’ve got cancer, let’s dwell on the fact I have cancer” story, instead her having cancer was just a part of her character, in a way. It wasn’t the main focus of the story is what I’m trying to say. I liked this because it meant that the story could be told and draw people in for it being a good story in itself. I do think the fact that Green doesn’t focus on the cancer in fact allows the reader to connect more with the characters and realise just how bad cancer is because when it is mentioned it has a major impact on the reader (in one part it came in the form of tears). I must confess that I am a huge fan of Green’s works because he has a sense of humour in his novels that I have yet to find in any other book. The Fault in Our Stars was not the first Green book I read, and I’m rather glad about that because it didn’t give me any expectations for his other novels and I’d read ‘An Abundance of Katherines’ first. In all fairness I could have put any Green novels on this list, I’ve just chosen The Fault in Our Stars because it drew the biggest emotional response from me. 4. 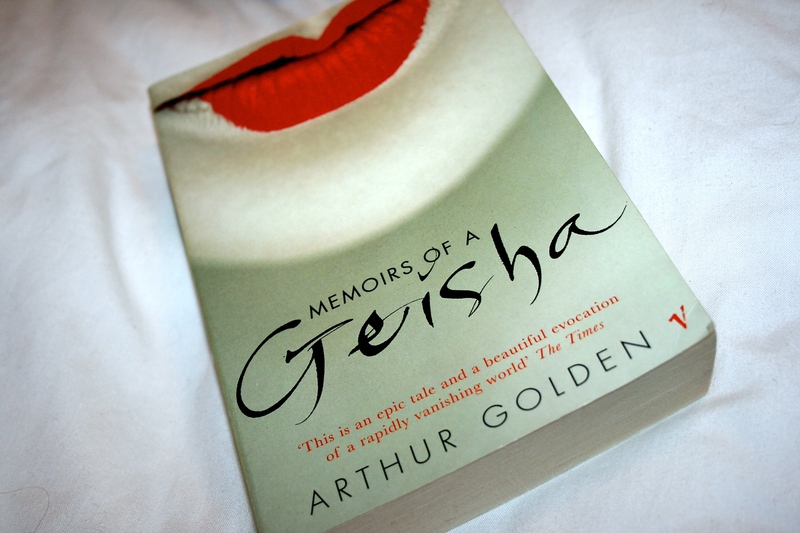 Memoirs of a Geisha – Arthur Golden. I wasn’t expecting to like this book when I read it. I just heard that it was very good and had seen it recommended quite a few times so I decided to read it. I am so glad that I decided to read it because I completely fell in love with it. 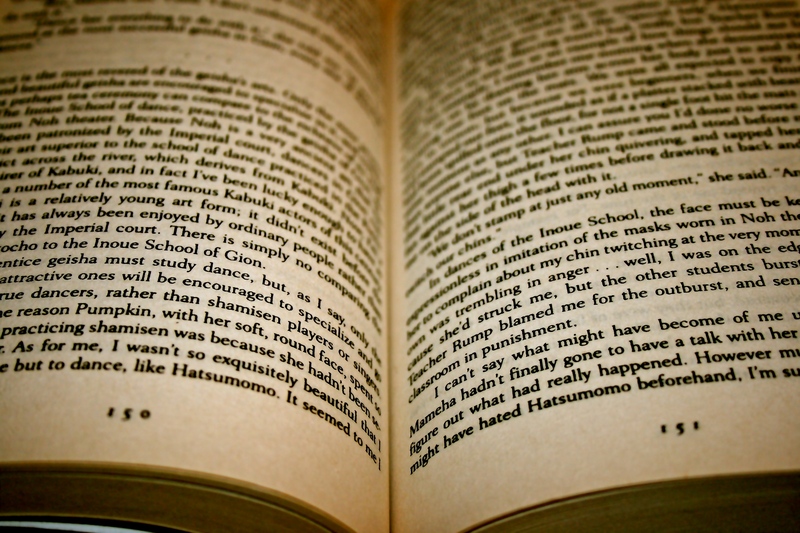 What I really loved about this book is that it was about a completely different culture of which I knew nothing about and so it taught me a lot about how the Japanese Geisha lived back in the 1920s and through world war two. I personally love learning about different cultures (which is why I’ve taken philosophy and ethics A level) and therefore this book really did work for me. So I guess this book isn’t really for everyone. I’m going to be sexist and say it is more of a feminine book (despite being written by a male) however that’s definitely not to say that a guy can’t read it and love it as I do! I guess it just depends on the person. I mean, some of the books I’m reading for English lit I don’t like but my teacher loves, and he’s also told the girls that reading one of the suggested books is not the wisest of ideas (American psycho – I’m giving it a miss) however one of the girls in my class is enjoying it – each to their own – that’s what I say. As I said, I decided to give this book a go despite not really being sure about it and picked it up for £1.50 from my local charity bookshop (where I happen to volunteer every week) – a bargain! 5. 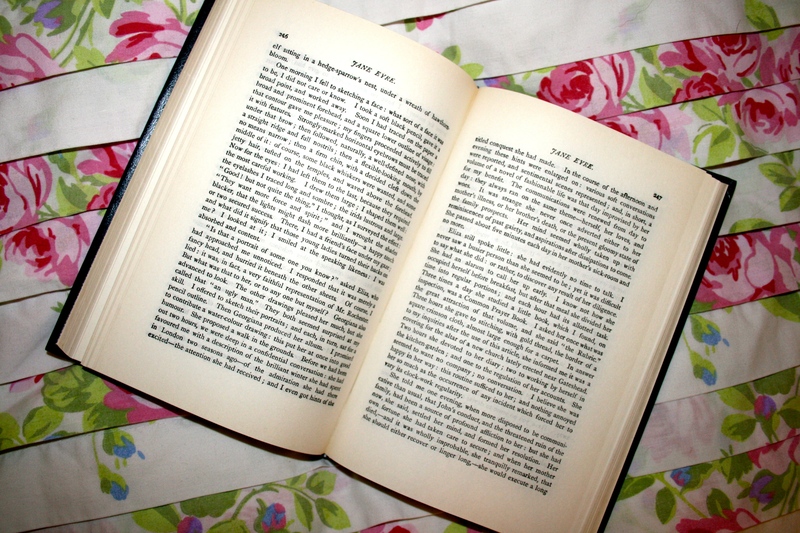 Jane Eyre – Charlotte Brontë. 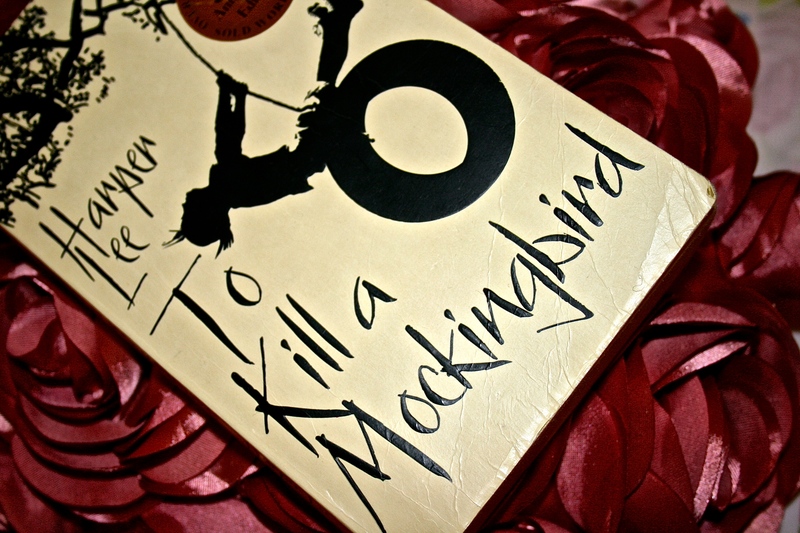 I believe that I read this book the same summer that I read ‘To Kill a Mockingbird’ and I fell in love with this book too. (That was a good summer for reading). Unlike many of the other classics I’d read previously (predominately children’s classics, but a couple of adult ones too) I didn’t struggle to get into this book at all. I really enjoyed the storyline of this novel and loved all of its twists and turns. The copy of the book shown in the picture I picked up from the charity shop for £1.99 and it’s a really nice copy. Only, the cover didn’t photograph well at all! This is another book that I shall keep with me forever because I just love it and really want to re-read it at some point when I’m not reading books for English! Jane is really down to Earth and you can’t help but like her and Mr Rochester is quirky – but in a good way! A really enjoyable and easy read, despite it being a classic! 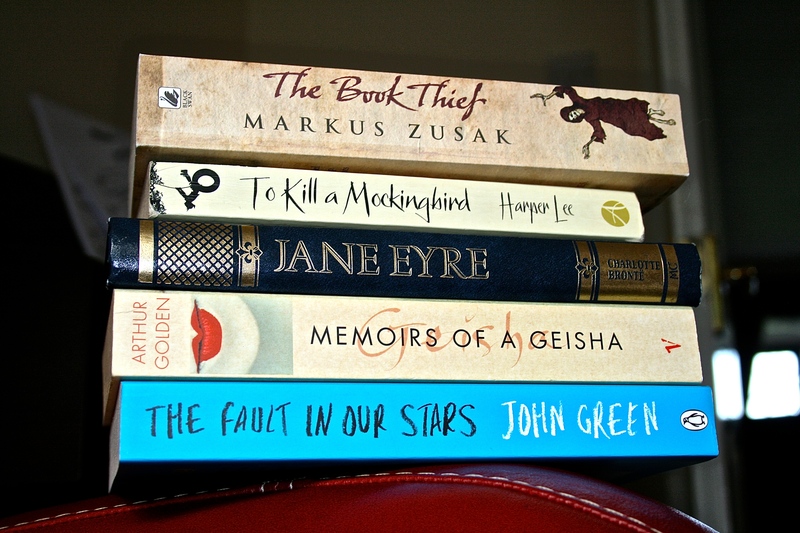 Those are my five top books, however I could go on, and on, and on about books I like! 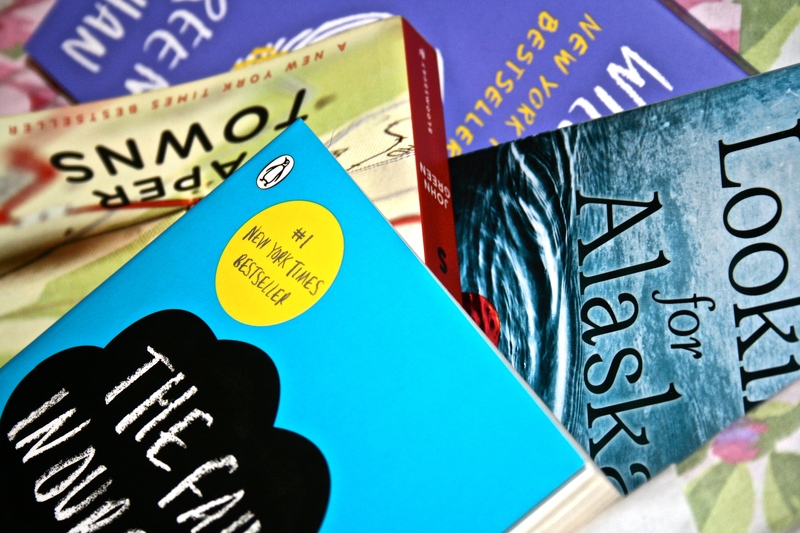 I would definitely recommend reading these books because they are so enjoyable and readable and I loved them – and who doesn’t recommend books they love? !